Mayan Traditions vs Nephite Traditions – Are the similarities too great to go unnoticed? The history, culture, customs, and religious beliefs of the ancient Mayan people are strikingly similar to those of the Nephites. Considering that the Book of Mormon is not a history of a people or civilization, but rather for ‘the convincing of the Jew and Gentile that Jesus is the Christ’, it is amazing that so many similarities can be found in Mormon’s short abridgment. Below is a short, unfinished list of some of the customs and culture references which the Mayan and the Nephites share. Much of this list can be found in John L. Sorenson’s latest book, Mormon’s Codex. Each statement below is a culture reference to the Mayan society, followed by a corresponding reference from the Book of Mormon. Although this is not a comprehensive list of the cultural traits shared by both the Nephites and Mayan, it is an impressive list. 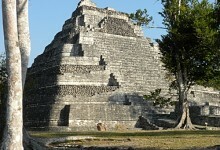 Visit the Mayan cities of Lamanai, Tulum, and Chocchoben and see the Book of Mormon come to life. Click Here for all the details, dates, and prices of our upcoming Book of Mormon Cruise.